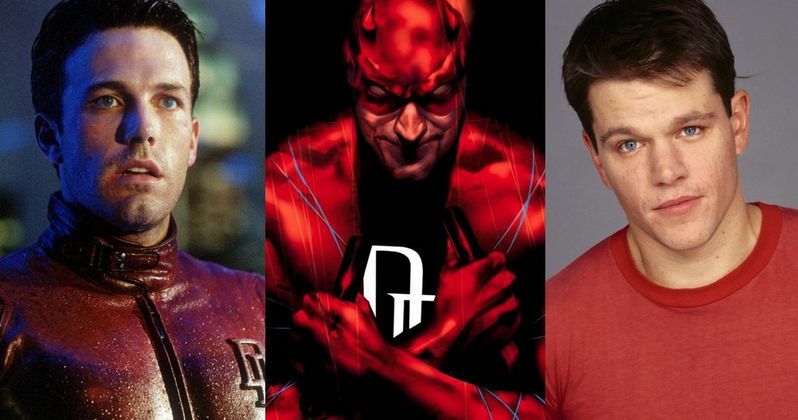 Would Matt Damon Have Been a Better Daredevil Than Ben Affleck? Longtime friends Matt Damon and Ben Affleck became international stars after writing and starring in the 1997 drama Good Will Hunting. Just a few years later, Matt Damon became a bona fide action star in The Bourne Identity, although Ben Affleck suffered a temporary career setback, or sorts, by starring in the comic book adaptation Daredevil, which wasn't received too well by fans and critics alike. Both Matt Damon and Ben Affleck are at the top of their game now, with the former starring in the critically-acclaimed sci-fi drama The Martian and the latter taking on the iconic role of Batman in next year's Batman v Superman: Dawn of Justice. While promoting The Martian, Matt Damon revealed he was actually offered the Daredevil role first, but he passed because he wasn't familiar enough with director Mark Steven Johnson's work. "For us it was always Daredevil - that's the comic we read when we were kids. But when that one came along (in 2003) I chickened out, because I couldn't tell. I hadn't seen the director (Mark Steven Johnson's) work and I didn't know. So I just said, 'No.' Ben was like, 'I gotta do it.' And the movie ended up doing very well, even though I don't think Ben was ultimately very proud of it." Matt Damon's assessment of Daredevil doing "very well" may be a stretch, since the movie earned $179.1 million worldwide from a $78 million budget. While it certainly wasn't a box office flop, it didn't set the world on fire either. Ben Affleck revealed in a 2014 interview that Daredevil is the only movie he regrets doing because he loved the character and the story so much, and the fact that it got "f---ed up" still stays with him. He added that failure may have been part of the motivation to take on the Batman role in Batman v Superman: Dawn of Justice. As for Matt Damon, the actor added that he would consider playing a superhero if the right role came along. For instance, the actor said that if Christopher Nolan was doing Daredevil, Damon would sign on, but that scenario is quite improbable. Marvel won the rights back to the character from 20th Century Fox in 2013, launching their popular Marvel's Daredevil TV series on Netflix earlier this year. Production is under way on the second season, and it doesn't seem that the studio has any plans on moving the character to the big screen quite yet. Matt Damon recently started production on the Bourne 5, which Universal Pictures has slated for release on July 29, 2016. After The Martian hits theaters next weekend, the actor will next be seen in The Great Wall and Downsizing. Do you think the 2003 Daredevil movie would have turned out better with Matt Damon instead of Ben Affleck? Let us know what you think below.